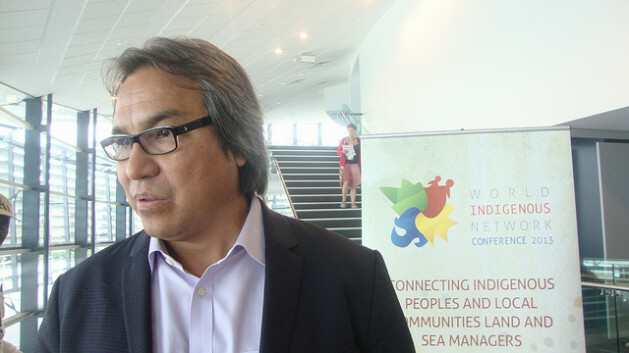 Anaya, an attorney, professor and the United Nations Special Rapporteur on the Situation of Human Rights and Fundamental Freedoms of Indigenous Peoples, formed part of the diversity of faces, languages, cultures and experiences that came together at the World Indigenous Network (WIN) Conference held May 26-29 in Darwin, Australia. In his 30-minute presentation, Anaya stressed the importance of the implementation of measures by national governments to ensure respect for the United Nations Declaration on the Rights of Indigenous Peoples, adopted in 2007. During his brief stay in Darwin, Anaya made time to speak with Tierramérica about the controversial implementation of prior consultation with indigenous peoples and the challenge of designing models of development that can enable countries to achieve prosperity while respecting the rights of native communities. In his opinion, Peru is the Latin American country that has made the most regulatory progress in the implementation of prior consultation with indigenous peoples on projects or activities that affect their territory or culture, as established in Convention 169 of the International Labour Organization (ILO). But Peru still needs to demonstrate its capacity for respecting indigenous rights in practice. “Learning comes from experience, and in Peru they are working on building an adequate process,” he commented. Ecuador, Bolivia, Brazil and Colombia are discussing these mechanisms, although they have yet to establish rules or protocols for conducting consultations. In Anaya’s view, countries do not necessarily have to adopt laws before beginning the consultation process. The main requirement is the “will” to respect indigenous rights, he said. Q: There is a perception that some governments in Latin America operate with a double standard: they sign international instruments to protect indigenous rights, but don’t implement measures to respect them. Do you agree with this view? A: I believe the fact that almost all the Latin American countries have voted in favour of the United Nations Declaration on the Rights of Indigenous Peoples and ratified Convention 169 is an advance. These are important steps. Now it is time to implement these processes, but this is very complex. States need to make efforts to confront this challenge. There are a number of issues that need to be considered here: first, state officials need to be educated to understand that these rules are not only a question of international relations, but that they need to be applied internally, because they are directed at the indigenous peoples who live in their territories. The second thing needed is the political will, and sometimes this is the problem, because there are various political and economic forces that need to be dealt with. Third is the establishment of mechanisms for collaboration with indigenous peoples in order to implement the rules. Q: One of the areas where there is a great deal of resistance on the part of national authorities is the implementation of prior consultation. What is your view of the criteria being used by governments to establish whether an indigenous community has the right to be consulted? A: That varies a lot between countries, it depends on the state. Q: In Peru, for example. A: In Peru they are just beginning to apply their law and its regulations. I know there is a whole debate on the registry (of indigenous communities), but we still have to see how they are going to apply the law. I hope they will do it in accordance with international standards. On the other hand, it should be recognised that consultation is based on basic rights that in some way apply to everyone. In the case of indigenous peoples, because of their characteristics, there need to be special and differentiated procedures. This is not a matter of abstract considerations, it has to be addressed on the ground. Q: Speaking of concrete cases, in Peru there is a consensus on consulting indigenous peoples in the Amazon, but this is not the case when it comes to communities of peasant farmers that are located precisely in the areas where extractive activities are carried out. A: The rights of indigenous peoples must always be protected. It is necessary to move forward with development for the benefit of everyone, but protecting indigenous rights. And achieving both things is possible; they are not incompatible. A: The problem is that the models that have existed up until now have shown these (indigenous rights and economic development) to be incompatible. Perhaps it is a question of creating new models based on human rights, models that respect the rights of indigenous peoples. It’s not a question of putting a brake on development. Q: That seems like something so easy to understand, but there is a lot of resistance. A: There is a great deal of polarisation between the different parties, there needs to be more dialogue. Q: Do you think the state would lose its sovereignty if an indigenous community has the last word on whether or not an investment project can be undertaken on their territory? A: The state does not lose its sovereignty if it respects human rights or indigenous rights. It has to comply with these rules to respect those rights; the state cannot do whatever it wants. I would say that the respect of these rights is a way of ensuring that this sovereignty is exercised. When the state respects human rights, it exercises its sovereignty, because it is acting in favour of its citizens and peoples. Q: Nevertheless, there has been a loss of trust in governments. What can be done to ensure legitimate consultations and to open up dialogue? A: The mistrust and prejudice need to be overcome. It is a matter of creating open processes where indigenous peoples can voice their opinions and influence decisions, and where there is the necessary will to seek consensus. The problem is that sometimes there is a belief that consent is about saying yes or no, about who wins. Consent is linked to consultation; the purpose of consultation is to reach consent, to reach consensus. It is not a question of one side imposing its opinion on the other. * This story was originally published by Latin American newspapers that are part of the Tierramérica network.